Half hour later I was in a taxi en route to the home of Mr. Song, my host for the next nine days. Someone observing me then would have thought I was a bushman that had never been to a city before. I was amazed at the traffic, it was as heavy as any I’ve ever seen in any of the cities of the United States, and it kept moving. I was later to learn that Seoul’s population was over 13 million people and about half of them own vehicles. At last I arrived at my host’s home and met Mr. and Mrs. Song. Their three children whom I would meet the following day were already in bed for the night. After the wife showed me to the room where I was to sleep, Mr. Song and I talked for an hour or so. His wife couldn’t understand English very well, so he translated our conversation as we talked. I explained my mission to them, which was to visit a site on the Han river where I had taken part in a battle 50 years ago on March 7, 1951, and to see some of the results made possible by the sacrifice many foreigner, like myself made for the Korean people. I had often wonder if I, an African American, would be as welcome today, as we were 50 years ago. “You’ll find many changes my friend and a deep sense of gratitude from we Korean, although my wife and I weren’t around at the time, I am only 39 and my wife here is 37, so what we know of the war we learned from our parents and history books. But every Korean is very aware and thankful for the sacrifice you and many others made on our behalf, as you will see during your visit here. And we are very aware of your African American struggle in America. We too were subjects of similar treatment for hundreds of years, it took many wars to free ourselves from foreign control and enslavement,” Mr. Song told me. 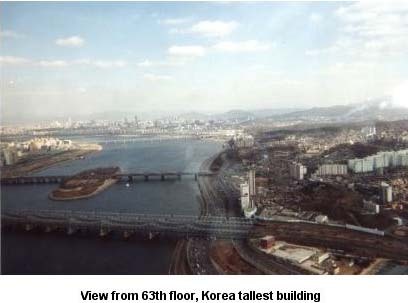 The following morning, March 7, I called Jeremy Kirk and with the assistance of Mr. Song, we arranged to meet at a nearby subway entrance at 1:30 pm, not far from Mr. Song’s home, from there we could go to the Han river. He had no idea of the location of the particular mountain I had described to him during our e-mailing communication over the past several weeks, but was sure we would be able to locate it before I leave. After eating the breakfast Mrs. Song prepared for me, I, having four hours to kill before my appointment, decided to explore the city a little. Mr. Song had earlier directed me to where I could find a tourist information booth they were situated at various locations around the city at which tourist could obtain a city map and get directions in English, Japanese or Chinese, to places of interest. There were several historical sites and museums in the very near vicinity. His home happen to be located near the center of Seoul, it was hard to get lost. About three minutes into my walk I found myself facing the gate of a famous landmark, CH’ANGDOKKUNG (Place) which was build in 1405 by King T’aejong, the third ruler of the Choson period as a royal villa. Thereafter, from 1615, kings ruled the country from there for over 300 years. Lucky for me there was a English tour of the grounds scheduled for 11:00 am, what a great way to pass the time I thought and purchase a ticket for about $2.00 and joined the twelve other tourist for the tour. It was a very interesting tour of an ancient palace that had survive many wars, including the one I had took part in. As we walked the grounds our tour-guide explained the different building and their functions (as they once were) to us..
For the purpose of exhibiting various historical records and relics of their patriotic ancestors who fought gloriously to protect their country from numerous foreign invasions. the Korean have constructed a magnificent War Memorial to house war relics and deeds of memories of there ancient and present heroes : and also to acknowledge those United nations Warriors that fought alone side of them during their last major war against the communist forces of North Korea..
FREEDOM IS NEVER FREE. OTHERS FOUGHT AND DIED FOR IT. Not only did they feature war relics and records of heroic military deeds of the 1950 to 1953 war, but every wars their country had endured from the ancient to recent times. It was well put together and we spend several hours admiring their many exhibits. I guess the monument below of two brothers embracing sums up the average visitors impression of this museum. A couple day before my visit was due to end I decided to take a train ride to Pusan and back, I wanted to see some of the countryside before leaving I didn’t know one should make reservation to ensure getting a seat. 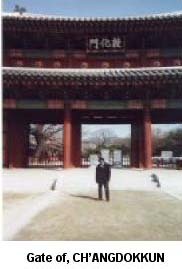 I was to learn many Koreans took weekend trips to visit family members or just a pleasurable family outing. Refusing to except a maybe not, early the next morning I proceeded to to the train station and learn there was a seat available only in the 1st class car.. Perfect I thought and quickly purchase a ticket. 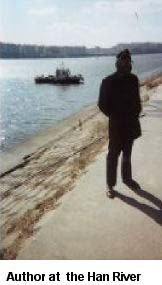 That was fifty years ago, I was 18 then, now I am 67, I relaxed and enjoyed the train ride to Pusan. No trip to Korea would be complete, for us veterans that is, without visiting the Demilitarized Zone (DMZ). I made mines the day before my departure. It was interesting, many restriction but nothing unbearable. I didn’t take many pictures there, partly because of the restrictions, I would’ve like to taken some in the tunnels, build by the North Korean, now that was interesting, we were told it took them three years to blast them (5 in all) out of solid-rock for the most part, yet were undetected by South Korean and United Nation forces in the south. Make you want to wonder Huh. Of course we all had the same question, How could someone dig tunnels for three years (estimated) two or so miles long, using jack-hammers and dynamite for three years, yet go un-notice. I just completed the first of a series of children, picture books, based on African mythologies. What's A Commie Ever Done to Black People?